Soha Housing contacted Jewel Training & Development back in October 2016 looking for us to deliver a leadership and management qualification. There were vacancies on the Board, and Soha was setting up a new trainee Board Member scheme wanting new recruits to have the opportunity to gain a qualification as part of the process. The business changes that were occurring necessitated the Board Members to be able to “hit the ground running”, and therefore Soha had very clear expectations of what the Board Members needed to fulfil as part of their role. How did we meet the customers needs? We met with Soha and quickly established that their needs would not be met by an off the shelf leadership and management qualification. However Soha did want the training to be recognised by an awarding organisation. 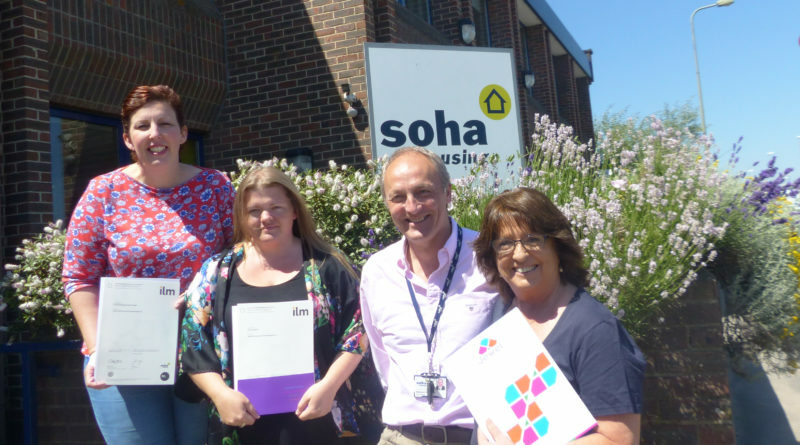 We worked closely with Soha over the next year building up a bespoke Tenant Leadership Training Programme that met exactly the needs of Soha and aligned to the roles and responsibilities of a tenant Board Member. This included identifying the right development modules and deciding who was the best trainer to deliver these modules. We agreed that two of the modules were so business specific that it was best that Soha managed the delivery of these two as part of the programme, while Jewel designed and delivered the other four modules. In addition we worked with ILM to build an assessment process for the bespoke Tenant Leadership Training Programme so that all successful trainees obtained the qualification. This assessment process required trainees to reflect on their learning from each workshop and formally present their learning and its impact back to the Senior Managers at Soha. The Tenant Leadership Training Programme ran from October 2017 to May 2018, and we are proud that all attendees were successful in gaining their qualification. More importantly the outcomes for Soha were realised. They succeeded in motivating individuals, providing consistent skills and knowledge specific for the role of Tenant Board Member and upskilling existing Board Members. Recently we had the privilege of speaking to Victoria, one of the trainees, who went on to interview for one of the vacant Board Member positions and was one of two trainees successful in gaining this new role. Victoria loved the learning so much, that by her own admission she spent “extra time to learn more”. Victoria has reflected with us on her training journey and has said it has “massively changed the way I reinvent myself. I feel like Victoria again, not just a mum with a disability”. Results like this really motivate the Jewel Team, demonstrating that we live by our motto – Developing Brilliance in People, Teams and Business.